During the early nineteenth century, the end of the Napoleonic Wars shaped the direction of the western world. After Napoleon’s defeat in the Cossacks (Russia) in 1814, the western powers reshaped the international order. To this end, the European powers that defeated Napoleon’s imperial ambitions (Russia, Great Britain, Prussia, and Austria) met in 1814-1815 in Vienna to create a new system of alliances that would keep the peace in Europe for the next 100 years. Called the Congress of Vienna, these meetings built a new international order based on the 1713 Treaty of Utrecht, creating a “balance of power” system throughout the region. This framework of negotiations continued to meet annually until 1822, when meetings met more sporadically. The Congress of Vienna was the first attempt by nation states in the modern period to create a system of peace that would be long-lasting, internally strong (which would be problematic due to the exclusion of the Ottoman Empire), and fair. The “Era of Good Feeling,” embodied by the Presidency of James Monroe (1817-1825), defined the decade. The Democratic-Republicans, a party solidified under President Thomas Jefferson, became the dominant party in the United States. The War of 1812, bitterly fought between the United States and Great Britain, had strained the young republic, especially for a young territory-turned-state like Indiana. As historian Logan Esarey notes, “the first results of the War of 1812 were disastrous. The inroads of the Indians broke up many settlements.” The election of 1820 saw President Monroe reelected to the Presidency with all electoral votes except one. This sweeping mandate reaffirmed the public’s trust in the Democratic-Republicans and Monroe’s vision for the United States. Yet the era was not without controversy. The hotly debated Missouri Compromise of 1820 created a balance of power between the slave states of the south and the free states of the north. The law called for Missouri’s admittance as a slave state and Maine as a free state, and prohibited slavery from the Louisiana Territory north of the 36° 30´ latitude line. This was a compromise created out of various bills passed by both the House and the Senate who could not agree on whether to admit Missouri as a slave or free state. The law would remain in effect until the Kansas-Nebraska was passed in 1854. The debate about slavery was an instrumental part of Indiana’s own founding, with factions on every side. 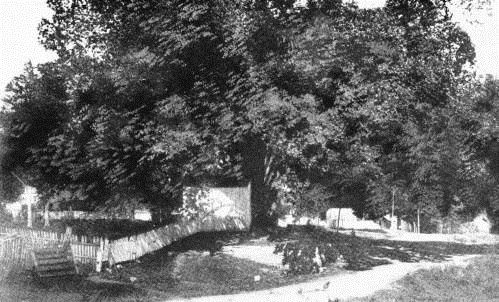 Constitutional elm in Corydon, under which constitutional delegates reportedly met during the convention, courtesy of Allen County Public Library, accessed Indiana Memory. During its first ten years, the General Assembly faced many challenges, but the issue that divided its legislators the most was slavery. Admitted to the union in 1816 as a free state, Indiana nonetheless was politically fragmented on the issue. Indiana’s first Governor, Jonathan Jennings, led a wing of fiercely anti-slavery Democratic-Republicans (the only party of consequence in Indiana at the time). On the other side, the James Noble faction was pro slavery and the William Hendricks faction was neutral on the conflict. To settle these divisions, the General Assembly passed a measure in 1816 that outlawed “man-stealing,” which authorized indentured servitude only if the claimant could substantiate his case in court, otherwise it was considered slavery and illegal under the Indiana Constitution. This ensured a compromise that kept all parties happy but allowed some forms of slavery in Indiana well into the 1830s. Other pressing matters in the first ten years of Indiana’s statehood included funding, construction of infrastructure, and selecting a new state capital. An Ohio Falls Canal, along the Ohio River, was proposed with financial allotments enacted by the General Assembly in 1818. However, by 1825, the canal project collapsed; poor management of its finances and Kentucky’s finished Ohio River Canal destroyed any chances of Ohio Falls Canal’s completion. Yet, these setbacks only served as a catalyst for future internal improvements. In 1820 and 1823, the General Assembly passed roadway legislation that, “provided for twenty-five roads along definite routes through various counties, including five that were to be routed to the site of the new seat of government [Indianapolis].” Costing over $100,000, these new roadway systems began the layout of Indiana’s infrastructure. Courtesy of the Indiana State Library, Indiana Division, accessed The Indiana Historian. 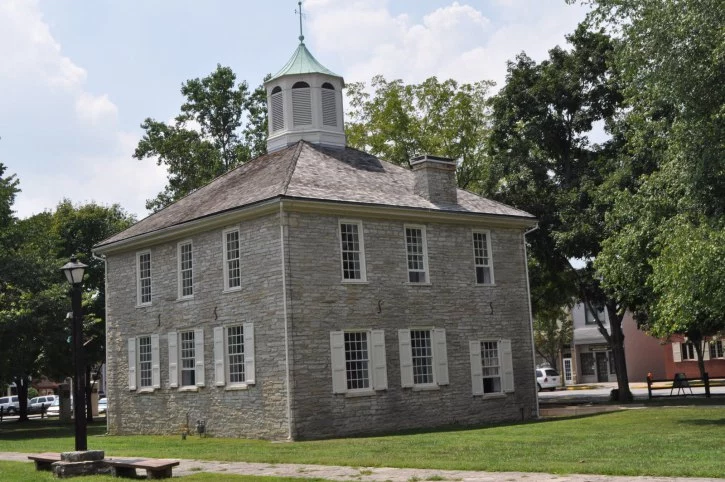 While Corydon served the state well as its first capital, northern migration facilitated the need for a more centralized seat of government by 1820. Named “Indianapolis” by state Representative Jeremiah Sullivan, the new state capital was surveyed by Alexander Ralston and Elias P. Fordham. 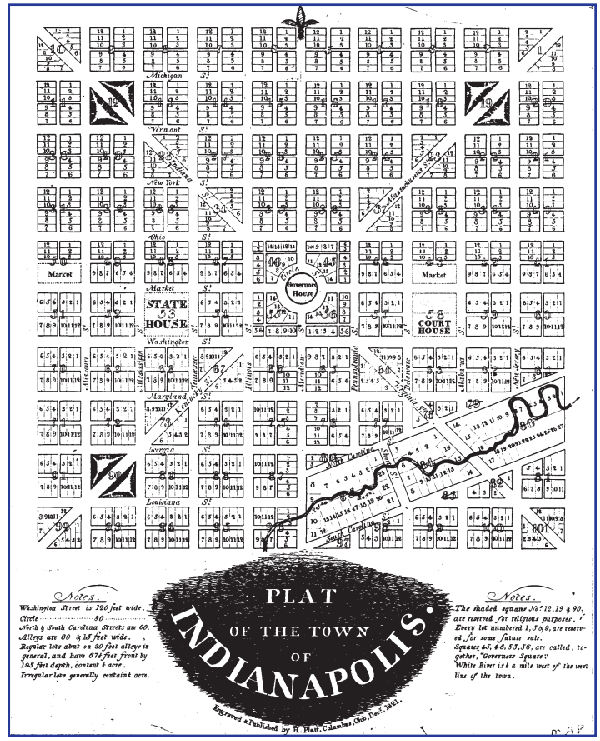 Ralston, a surveyor and city planner who had worked in Washington, D.C., surveyed plats for Indianapolis in a similar design to the nation’s capital. In 1822, the General Assembly approved a law authorizing plat sales to facilitate the transfer of government and the construction of a Marion County Courthouse. 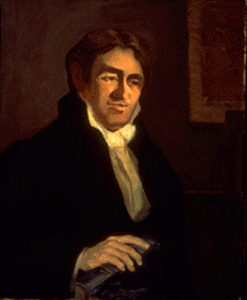 In the 9th session of the General Assembly in 1824, Indianapolis was made the legal capital of the State of Indiana and chose Samuel Merrill, the State Treasurer, to oversee the arduous task of moving the government. It took eleven days to trek the 125 miles to the new capital, but Merrill and the Indiana General Assembly had finally arrived at their permanent home. 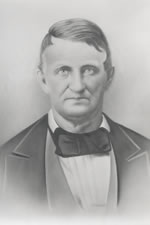 Thomas Hendricks, Governors’ Portrait, accessed Indiana Historical Bureau. Justice Isaac Blackford, courtesy of Courts in the Classroom.